I am lukewarm about Curse of the Ancients by Matt de la Peña,(2013,188 pages), which is the fourth installment in this series of eight books written by different authors. If you are already a fan of the series you will probably enjoy it, although this story in itself is unlikely to win converts to the series. I thought Infinity Ring #3 was a stronger book (my review), but in fact, I’m not wowed by the series in general. However, I wanted to review this story because Infinity Ring is enormously popular, and people are searching for information about this series. I know because my post on Infinity Ring #1 has received over 1,100 views! Although author Matt de la Peña wrote the words to the picture book Last Stop on Market Street, which won the Newbery Medal in 2016, and also wrote the acclaimed Ball Don’t Lie, sadly, I think this genre does not allow his voice to shine. (He also penned the last book in this series.) When approaching this series it’s probably ideal to start with the first book which lays the foundation for the series, but beyond that, Infinity Ring books can be enjoyed out of order. The time travelers’ mission in this book is simply “Help the Maya, 1562.” Specifically, that turns out to mean protecting a codex, a hand-written book, from burning by the Spanish invaders. It would have been nice if the author included a few more sentences about what codices are and why they are important. I recommend reading a bit about Maya codices on Wikipedia; after I did so I was more invested in the plot. The idea of preserving cultural artifacts is very positive, and I appreciate that the conquistadors are portrayed as thoughtless and cruel, a nice corrective, especially for someone of my generation who grew up actually celebrating Columbus on Columbus Day. The series in general might spark an interest in history, and possibly this book could make some people more curious about the Maya. The action moves swiftly. Little time is wasted on description. It’s often funny. Friendship is valued. Sera, Dak, and Riq really support one another, and friendship is an explicit theme in this story in other ways. Sera is a strong, STEM-loving role model. We need more diverse middle-grade book characters, so it’s great that Sera is Latina, and Riq is African-American. You always have to suspend some disbelief when reading time travel stories, but I find the premise of this series harder to swallow than most. The overarching idea is that an evil group known as the SQ has, for unknown reasons, changed the way many events in history have occurred. These changes will eventually lead to a nightmarish, premature end to our world. A group called the Hystorians who are a force for good have recruited Ser, Dak, and Riq to go back in time to fix these “breaks”. But since one event leads to other events, it seems to me the “mistakes” the SQ precipitated would have caused an uncountable number of changes which would then also need to be fixed. However, probably most kids would not be bothered by this paradox, and I admit you do have to accept a certain measure of paradox to read or write a time travel story. The kids’ time travel instructions are written in riddle form. This seems gimmicky to me. The fact that the instructions are written in riddle form at all, and the way the answers to the riddles get revealed seems contrived. The main characters refer a few times to the stereotype that the ancient Maya were violent, as they refute the stereotype. A quick convo with my junior high schoolers revealed they did not share this stereotype. I believe many of the target readers also don’t share this stereotype, so to bring it up is I think counterproductive. Dak had been my favorite character in the series right through Infinity Ring #3, and I always found many of his comments amusing. However, whether because of the sheer quantity of his remarks in this story or their lack of quality, like many other reviewers, I am beginning to find his comments cringe-inducing. Some other dialogue seemed stilted to me as well. What is a Lexile Level, and Why Does it Matter? If you are searching for “just right” books for your child or grandchild, I recommend asking your child’s teacher what the child’s Lexile level is. This is a score obtained by the student taking a reading comprehension test. Students earn a Lexile reader measure from below 0L to above 2000L. To find a bunch of books at that level in different interest categories you can go to lexile.com and enter your child’s Lexile level. My eleven year old and I have discovered some exciting stories in the Adventure category this way! When picking a book you don’t have to match the number on the nose. My son’s school gave an appropriate “Lexile Range” that ranged from a hundred below his score to fifty above his score. Alternatively, you can go to the site and enter the name of a particular book you are curious about to get the Lexile level for that book, although not all books are included in the site’s database. A Lexile measure does not address the content or quality of the book. A Lexile measure is based on two strong predictors of how difficult a text is to comprehend:word frequency and sentence length. Many other factors affect the relationship between a reader and a book, including its content, the age and interests of the reader, and the design of the actual book. The Lexile measure is a good starting point in the book-selection process, but these other factors should be considered when making a decision about which book to choose. I suspect the books don’t vary as much in difficulty level as these numbers might suggest. Amazon gives a recommended age range of 8-12 years for each book. I would put the sweet spot for Infinity Ring readership at about fifth grade. Time Spies by Candice Ransom, (6-10, Lexile 540). Blast to the Past by Stacia Deutsch, (7-10, Lexile 480). The Missing by Margaret Peterson Haddix, (8-12, Lexile 750). See the long list of every middle grade series I know of here! 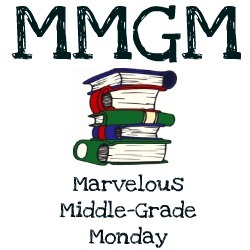 You can find links to several book bloggers’ reviews of middle grade books most Mondays at Greg Pattridge’s blog Always in the Middle. It’s always worth a look! This entry was posted in Book reviews and tagged Curse of the Ancients, historical time travel book series, Infinity Ring Book Four, Infinity Ring Series, Matt de la Pena, time travel books for children, time travel books for kids, what do Lexile levels mean. Bookmark the permalink. Awesome how many page views your review got. I’ve never read a series written by different authors,although I know Scholastic does that. Too bad you didn’t like this one better but great that you have stuck with the series. Thanks for the other time travel books too. Natalie, Yes the 39 Clues series is also written by different authors. It seems like that would make it harder to keep things consistent from book to book. Greg, It’s a very popular series. Thanks for you honest and insightful review. I was surprised the series has been written by different authors. I have always had an interest in the Mayans, but not sure this series grabs my interest. Thanks for sharing the information on the Mayan coedices — which is really challenging material, but interesting about the frauds. I knew nothing about the lexile levels as a guide in picking books. Patricia, Interesting that you hadn’t heard much about Lexile levels. They talk about it a lot in my school district, but I don’t know how much attention it gets in the country overall. I am also interested in Maya history! This is a great post — so full of good information. Thanks for such an honest review, but then I always find your reviews to be terrific. Thanks for this rich post. Thank you so much, Rosi. I would sincerely say the same about your posts. I have this series in my library- but I haven’t read them. This is my 4th year as a media specialist and I read new books all the time. I haven’t read many series where different authors write different books in a series. I have read the first book in quite a few of those series though. Thanks for sharing your review. Very helpful! Stephanie, I envy you your job duties, but I’m sure you could use a little more time for reading. Glad you found the review helpful.